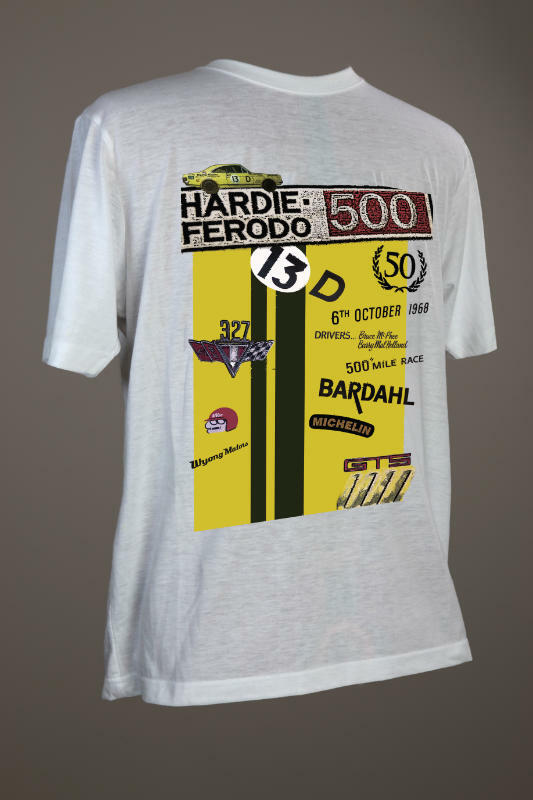 A retro motorsports t-shirt celebrating the 50th anniversary of the General’s first win at The Great Race. It was in October 1968 that the yellow 327 cubic inch V8 two door HK Monaro coupe, was driven to victory by privateers Bruce McPhee and Barry Mulholland, against a field of much more fancied opponents. The design is a great piece of art and looks fantastic in a distressed print for that retro look. The shirt is a 160 GSM 100% Combed Ringspun Cotton shirt that offers extreme comfort and wearability. This garment is not officially endorsed, approved or licensed by any rights holder. Any logo or graphic device that is featured is employed in a purely decorative manner and is not intended to imply a source of origin. A retro classic t-shirt featuring a Repco Brabham montage. 1977 Falcon XC Hardtop reflected in a relief of its principal driver Allan Moffat.